Cold & Snowy = Soup Day! Something quite distressing happened her in the Northeast yesterday. It snowed. Now, I’ve lived in the Northeast for going on 26 years, so I should be used to this sort of thing by now. But every year, the first flakes of snow take me completely by surprise. It’s even more surprising when they come blowing in with freezing wind and subnormal temperatures several weeks before Thanksgiving. It was so chilly and damp that there was only one solution. 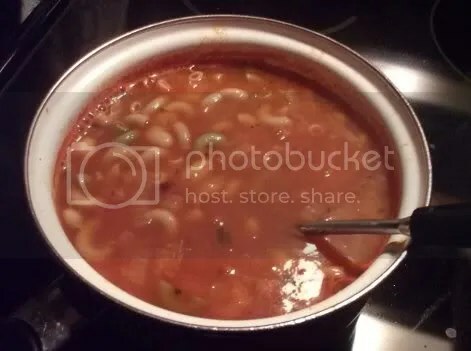 Make soup! This was another meal inspired by the presence of leftover beans. This time they were canellini beans, so I went looking through Vegan Planet for white bean recipes and out popped Tuscan white bean soup. 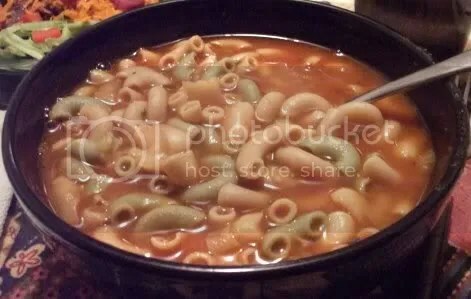 I liked the idea of a soup full of elbow macaroni, especially since I knew we had these awesome whole wheat tricolor elbows in the pantry. All I can say is, Robin Robertson does it again! I think I’ve mentioned that I don’t often make soup, but with recipes like this there’s really no reason for that. 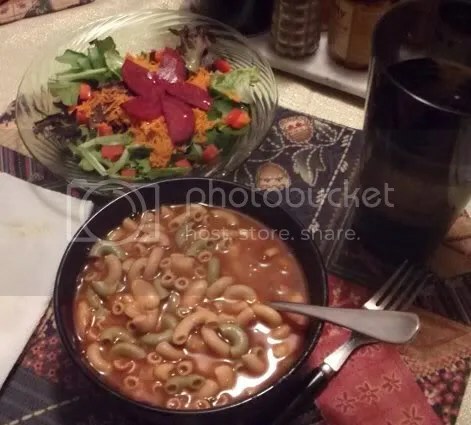 Between the beans and the macaroni, it was such a hearty soup that all it needed was a salad to make it a meal. 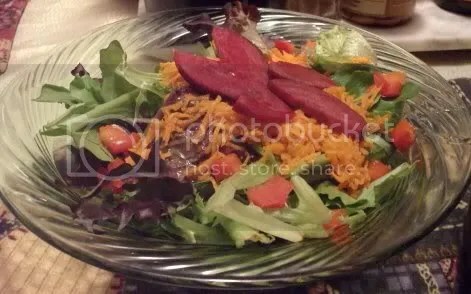 While the soup was cooking, I tossed some mixed greens in bowls along with grated carrot, chopped red pepper, and sliced beets. My mom dressed hers with oil and vinegar, and I used red wine vinegar and a little black pepper. The seasonings for the soup were simple too; just some onions, garlic, a little oregano, and red pepper flakes. (I had to leave out the bay leaves, as they’re one of the random things I seem to be allergic to.) It was a great way to conclude a rather dreary, cold day. Question for the comments: What foods do you start to crave when it snows? … the answer to you question would be soup!